Rumor swirled that maybe some former USC alumni would be in attendance for ‘Part III’ of the USC v Texas matchup and I figured the Heisman House would probably be the best place to catch some of them. This added up with the fact that Vince Young was already hosting a get together of sorts between the 2005 National Championship teams (USC v Texas) in Austin during this period. 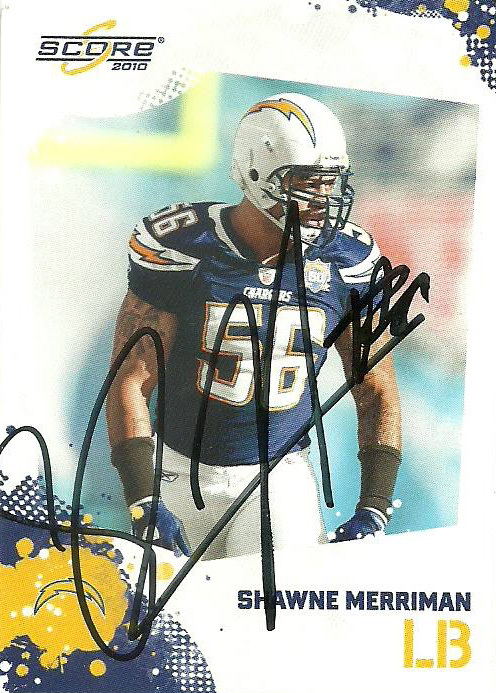 I pulled some cards from the 2005 USC team. I speculated Reggie Bush was too controversial to be there- since he had to forfeit the trophy he lost that VY later rejected. I thought well maybe Matt Leinart, or another USC Heisman winner. My friend Deadhorse suggested Charles White or Marcus Allen. I then thought, maybe LenDale White since he and Bo Scaife are good friend and have their own show called “The Players’ Lounge”- and packed them all in the infamous long box. See the rule is- always plan as though anybody can be there. That’s how I got Harvey Martin and Roger Staubach. That’s also how I missed on Babe Laufenberg at the Spring League game in 2018. It’s also how I got a hit on Troy Polamalu and Hines Ward. It was a terribly humid day with thunderstorms forecast for the entire day. I met up with a fellow collector- Jeff. He and I have many parallels in our life. We both had our first kid recently, and we both used to be denizens of autograph alley back when the Cowboys practiced at St. Edwards. I am always eager to network with other like-minded collectors and we make a pretty good fit. His wife and son also came and somehow managed to bare the humidity. (Not only does my wife deserve credit for allowing me to go to such things, Jeff’s wife should get a trooper badge for showing up to them with him.) We waited in line and got Ricky Williams– twice. In the meantime his wife got back in line for VY, so we joined her in that line after we got done with Ricky. Behind us a commotion occurred and I noticed that some USC players were taking photos with somebody with dreads. Before I could ask, he was already leaving to go inside. 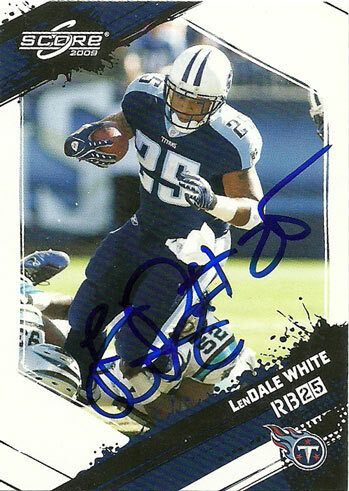 I found out then it was LenDale White. 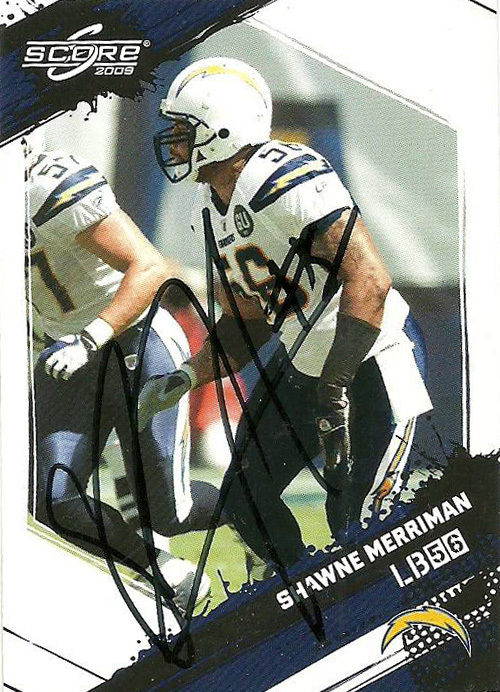 I pulled the extra cards that I brought of LenDale- numbering some 6, took two for myself and gave the other two to Jeff and then I vigilantly waited for him to appear. It turns out that LenDale and Vince Young are really good friends. They got to know each other better when they played on the Titans together, and apparently talk on the phone almost every day. During Vince’s interview about the 2005 National Championship Game, LenDale came out from the trailer connected to the tent and onto the stage and was hanging out in between sets. It was then I was able to approach him and get him to sign two cards for me. LenDale was looking quite svelte. When I asked him what he had been doing with himself to look so cut- he laughed and said, he stopped working out. I always felt like he got a bad wrap coming out of college, and that he was a better back than he was given credit for. He thanked me for the compliment, and we wished each other good luck for that evening. A few minutes later Jeff came back with his signed in hand as well. It was a great experience, and we were able to make the weekend signing worthwhile. The initial goal was the clear the table with Ricky and a VY or two. 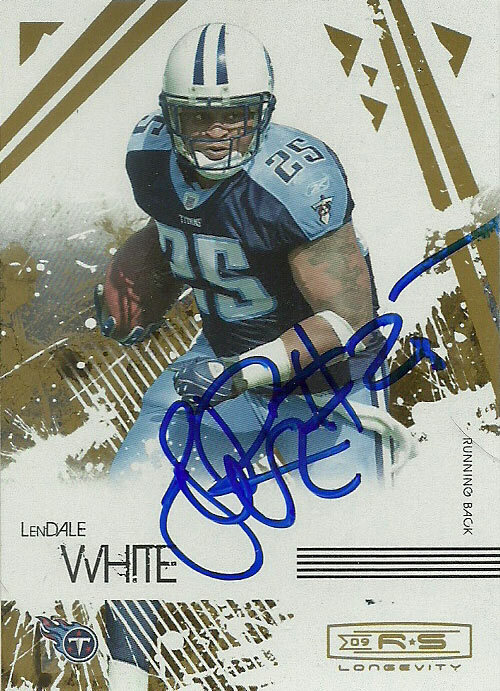 Anything else was just gravy- and nabbing LenDale White was quite the treat. Hines Ward played 14 seasons in the NFL from 1998-2011. After posting decent numbers for the Georgia Bulldogs (144 receptions for 1965 yards and 11 TDs) over his college career, Ward was selected in the 3rd round of the NFL Draft by the Pittsburgh Steelers. Although he didn’t find immediate success, by 2001 Hines was really starting to round out as a marquee receiver, posting his first (of 4) 1,000 yard campaigns, and first (of 4) Pro Bowl appearances. In 2002, he’d have a career high 112 receptions for 1329 yards and 12 TDs. Hines won Super Bowl XL MVP honors after catching 5 passes for 123 yards and a TD. Despite legendary names in the Steelers wide receiver corps, Hines finished at the top of most of the team’s charts before retiring. He’s dabbled here and there in sports commentary and as a celebrity judge, but it was when he was given the opportunity to be involved with the AAF that he has really seemed to jump out there. After getting lucky with Troy Polamalu at the San Antonio Commanders team reveal, I stocked up on other executives for the inaugural game. The ticketing office hit a snafu with me on my tickets and offered me a floor pregame pass during the season. I asked to get on the field for the opening game- but I was told that the league was expecting a lot of executives for the event. I took this as a good omen. Sure I could’ve kicked myself for not packing a card of Kurt Warner who was broadcasting the game, but I was happy as it was just to get Hines. Standing in the front row of the endzone, nobody noticed Hines. I waited until he got a good, close distance to me and called him over. He hesitated for a moment and then told his guest he was going to sign some autographs. I think he signed for two reasons. One, he had made it so long without somebody recognizing him wandering around the stadium, so I had to be a fan. Two, Hines is all on board with the league and its mantra. He is genuinely excited to share the vision of the league with fans. Later when I posted the autograph to one of the message boards on Facebook, I found out that I was lucky to not only get two autographs out of him- but that I also got his full signature. If I hadn’t gotten another autograph for the rest of the evening I would’ve still been tickled pink about it, as I learned firsthand that he can be a erratic signer back in 2016. This Upper Deck 2009 was amazing, and the photo is a rare treat. 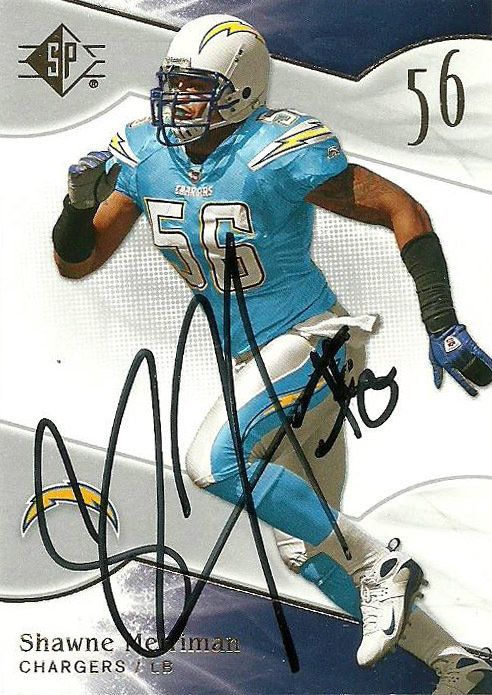 Hines put the autograph to the canvas perfectly! It compliments the image well and makes it feel even more exciting. The 2009 Score was a set need. I wanted the 2010 Score, but I thought just getting two autographs from Hines was greedy enough.